Wanda Walker was distraught over her ailing daughter and frequently confided in a close co-worker who helped ease her pain. Unbeknown to both of them, that colleague would eventually save her daughter’s life. Northwestern Medicine performed a chain of anonymous kidney transplants just before Christmas, with three living donors who all thought they were giving their organs to help strangers. By rare coincidence, one donor and recipient were already entwined before surgery: 31-year-old Alecia Walker of Chicago’s South Shore neighborhood now has the kidney of 33-year-old Kevin McCallister of Wood Dale, the man her mother once leaned on for support at work. Alecia Walker embraced McCallister, her left side — now home to his kidney — grazing his left side, where the organ was removed. McCallister kissed her cheek and wished her good health. Hospitals have performed these types of paired organ exchanges for more than a decade, with kidneys by far the most transplanted organ. Donors usually want to give organs to loved ones but find out they aren’t compatible; instead they end up donating to a stranger who is a match, and their loved one gets an organ from another unknown donor, creating a circle of anonymous givers and recipients. This particular three-way dance at Northwestern was unusual because two families involved already knew each other. To be compliant with hospital and federal policy, the names of the donors and recipients were kept strictly confidential, ensuring that the gift was voluntary and free of coercion or any financial incentives. The surgeries took place simultaneously in adjacent operating rooms, and identities were disclosed only after recovery with consent of all six participants. The demand for kidneys is far greater than the supply. About 92,000 Americans are waiting for a compatible kidney, and the clock often ticks down before a match can be found. The typical wait for a deceased donor is four years, and in 2012, an estimated 12 patients died every day while on the wait list, according to the United Network for Organ Sharing, a national agency that manages organ allocation. But these arranged swaps can often increase the odds of a transplant. 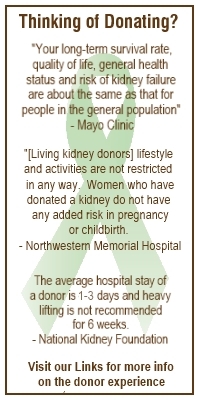 There were 5,619 kidney transplants nationwide from living donors in 2012. Of those, 528 were the result of anonymous kidney exchanges. The largest one at Northwestern was an eight-way trade in 2010. Alecia Walker wondered if she would be one of the lucky ones. Her health had failed since 2007 due to Type 1 diabetes. Wanda Walker, typically quiet and reserved, opened up to McCallister about her daughter’s poor health at the real estate property management firm where they worked for about two years. It wasn’t until after the co-workers parted ways in late 2010 that Wanda Walker learned her daughter was suffering from renal failure. Alecia Walker was dizzy and tired, which made it difficult to care for her 3-year-old daughter, Iyana. Wanda Walker felt helpless. She had just had surgery herself, so doctors said it wouldn’t be safe to give her organ to her daughter. Then, in February, McCallister learned that his adopted brother, David McCallister, was diagnosed with a hereditary renal disorder and his kidney function had dwindled to about 1 percent. He was tethered to dialysis — a machine that cleanses the body of waste — which left him exhausted. Kevin McCallister longed to give him a kidney. “I’m sorry,” he said to his brother over the phone after learning they weren’t a match. But with the help of one other donor, they could complete a circle. Muriel Elder, 54, of Chicago’s Marquette Park neighborhood, suffered from polycystic kidney disease. She had already received one kidney from her husband, but her body later rejected it. Her daughter Jasmine Jeffries, a 30-year-old postal worker, wanted to donate but was incompatible. But Jeffries was compatible with David McCallister. So Kevin McCallister gave his kidney to Alecia Walker, whose boyfriend, David White, 32, gave his kidney to Muriel Elder, whose daughter Jasmine Jeffries gave her kidney to David McCallister. While secrecy in the donor program is guaranteed, Kevin McCallister had his suspicions after eyeing his former colleague at the hospital before surgery. He remembered that Wanda Walker had a sick daughter and wondered if she would be the recipient. When all patients are willing to be identified, Northwestern Medicine periodically arranges for them to meet. On Dec. 27, the participants sat in six chairs, waiting to hear whose organ was in whose body. After the pairings were read by a doctor, the patients hugged and thanked one another, grateful for what they could give and receive. From your mouth to God’s years!!!!!!!!!!!!!! Great story! Hang in, Gary. Somewhere is your kidney beshert! Thanks, Sandee. We sure hope so.